SEHORE: The plight of farming families in MP is coming to fore in several ways and chief minister Shivraj Singh Chouhan’s home district Sehore is leading in many ways. The latest incident reported is about two teenager tribal girls who are working in place of bullocks in agriculture fields with their father in village Basantpur Pangri of Nasrullahganj block. 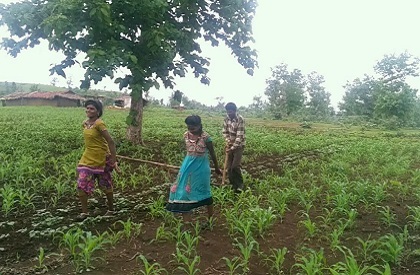 The family is so poor that they had to discontinue education of the two girls and have to take their help in tilling the fields as they cannot afford to buy bullocks. The girls regularly pull the plough through the field – a work considered very draining physically. However, the girls Radha and Kunti happily do it to help their father. Their father, Sardar Barela feels anguished and frustrated at the entire scenario though. Talking to media, he said that the education of the girls had to be discontinued as he did not have the money to get them enrolled to higher secondary school in a nearby town. Both the girls have studied till class 8. The family’s home is in a dilapidated condition and they do not even have access to potable drinking water in village, Sardar said. Barela has sown maize in his fields this year and the girls regularly accompany him to the fields for tilling work. Sehore collector Tarun Pithode, when contacted, said that the incident has been brought to his notice. “From the photographs it indeed seems that the girls are working in fields in place of bullock. But I have sent team of officers to the village and we would help the family as required,” the collector said.